The fans could enjoy quite many interesting games in the last round. The round ended with defeat of the leader. Here is the last round review presented by ESL. The most crucial game of the last round was another loss of Ryukyu GK (24-15) in Okinawa on Saturday night. Hosts were defeated by Chiba Jets (33-6) 76-62. It was a good game for American power forward Josh Duncan (203-86) who led his team to a victory with 17 points and 8 rebounds. The former international point guard Yuki Togashi (170-93) contributed with 14 points for the winners. Chiba Jets' coach Atsushi Ono used a ten-player rotation which allowed the starters a little rest for the next games. American forward Jeff Ayres (206-87, college: Arizona St.) answered with 11 points and 9 rebounds for Ryukyu GK. Chiba Jets maintains first place with 33-6 record which they share with defeated Ryukyu GK. Ryukyu GK lost fifth consecutive game. They still keep top position with 15 games lost. Chiba Jets will have a break next round, and it should allow them to practice more before next game. Ryukyu GK will play again at home against the league's leader Chiba Jets and it may be a tough game between close rivals. Another exciting game for Kyoto Hannar. (22-17) which played in Nagoya against second-best Diamond Dolphins (21-18). Third ranked Kyoto Hannar. won 89-82. It ended at the same time the two-game winning streak of Diamond Dolphins. It was a key game for the second position in the league. It was a great evening for American center David Simon (208-82, college: PFW) who led his team to a victory scoring 36 points (!!! ), 8 rebounds and 4 assists. Julian Mavunga helped adding 26 points and 9 assists. The best for the losing side was American center Hilton Armstrong (210-84, college: Connecticut) with a double-double by scoring 18 points and 10 rebounds. Diamond Dolphins' coach rotated eleven players in this game, but that didn't help. Kyoto Hannar. have an impressive series of five victories in a row. They moved-up to second place. Diamond Dolphins at the other side dropped to the third position with 18 games lost. Kyoto Hannar. will have a break next round, and it should allow them to practice more before next game. Diamond Dolphins will play again at home against the league's second-placed Kyoto Hannar. and it may be a tough game between close rivals. Fifth-ranked San-en NeoPhoenix (17-22) was very close to win a game against second ranked Toshiba Thunders (23-16) in Kanagawa on Saturday. Toshiba Thunders managed to secure only two-point victory 83-81. However their fans expected easier game. It ended at the same time the four-game winning streak of San-en NeoPhoenix. It was an exceptional evening for Nick Fazekas who led the winners with a double-double by scoring 31 points, 11 rebounds and 4 assists. Shinnosuke Ohishi came up with a double-double by scoring 18 points, 11 rebounds and 7 assists for San-en NeoPhoenix in the defeat. Both coaches used bench players in such tough game. Toshiba Thunders maintains second place with 23-16 record having ten points less than leader Ryukyu GK. Loser San-en NeoPhoenix keeps the fifth position with 22 games lost. Toshiba Thunders will again meet at home San-en NeoPhoenix (#5) in the next round. San-en NeoPhoenix will have a break next round. An interesting game for Toyama Grouses (20-19) which hosted in Toyama their close opponent Osaka Evessa (15-24). Fourth ranked Toyama Grouses had an easy win 85-50. The best player for the winners was Joshua Smith who had a double-double by scoring 19 points and 12 rebounds (went 7 for 7 at the free throw line). The winner was already known earlier in the game, so both coaches allowed to play the bench players saving starting five for next games. Toyama Grouses maintains fourth place with 20-19 record which they share with defeated Osaka Evessa. Osaka Evessa at the other side keeps the fourth position with 24 games lost. Toyama Grouses' next round opponent will be again Osaka Evessa (#4) at home. An interesting game for Tochigi Brex (31-8) which hosted in Tochigi 4th placed Hitachi Sunrockers (18-21). Second ranked Tochigi Brex had an easy win 91-71. It ended at the same time the two-game winning streak of Hitachi Sunrockers. It was a good game for Jeffrey Gibbs who led his team to a victory with a double-double by scoring 18 points, 15 rebounds and 7 assists. Both coaches tested many bench players and allowed the starting five to rest. Tochigi Brex maintains second place with 31-8 record having just two points less than leader Ryukyu GK. Loser Hitachi Sunrockers keep the fourth position with 21 games lost. Tochigi Brex will face again Hitachi Sunrockers (#4) in Tokyo in the next round. There were no big surprises in other games of round 39: Niigata Albirex beat Hokkaido L. on the road 79-64. Fukuoka Rizing lost to Yokohama BC on its own court 77-85. Shiga L-Stars unfortunately lost to Toyota Alvark in Tokyo 70-83. The most crucial game of the last round was another loss of Ryukyu GK (24-15) in Okinawa on Saturday night. Hosts were defeated by Chiba Jets (33-6) 76-62. It was a good game for American power forward Josh Duncan (203-86) who led his team to a victory with 17 points and 8 rebounds. The former international point guard Yuki Togashi (170-93) contributed with 14 points for the winners. Chiba Jets' coach Atsushi Ono used a ten-player rotation which allowed the starters a little rest for the next games. American forward Jeff Ayres (206-87, college: Arizona St.) answered with 11 points and 9 rebounds and the other American import forward Kevin Jones (206-89, college: W.Virginia) added 7 points and 10 rebounds in the effort for Ryukyu GK. Chiba Jets maintains first place with 33-6 record which they share with defeated Ryukyu GK. Ryukyu GK lost fifth consecutive game. They still keep top position with 15 games lost. Chiba Jets will have a break next round, and it should allow them to practice more before next game. Ryukyu GK will play again at home against the league's leader Chiba Jets and it may be a tough game between close rivals. No shocking result in a game when first ranked Niigata Albirex (28-11) beat 6th ranked Hokkaido L. (10-29) in Saporro 79-64 on Saturday. Niigata Albirex looked well-organized offensively handing out 21 assists. It was a good game for American Davante Gardner (203-91, college: Marquette) who led his team to a victory with a double-double by scoring 25 points and 10 rebounds. His fellow American import power forward Lamont Hamilton (208-84, college: St.John's) contributed with a double-double by scoring 19 points and 10 rebounds for the winners. Spanish center David Doblas (206-81) answered with a double-double by scoring 28 points and 10 rebounds and Canadian-Italian power forward Marc Trasolini (206-90, college: Santa Clara) added 8 points and 15 rebounds in the effort for Hokkaido L.Hokkaido L.'s coach Tomohide Utsumi tested ten players and allowed the starting five to rest. The victory was the third consecutive win for Niigata Albirex. They maintain first place with 28-11 record. Loser Hokkaido L. keeps the sixth position with 29 games lost. Niigata Albirex will have a break next round. Hokkaido L. will play again at home against the league's leader Niigata Albirex (#1) and hope to win that game. We cannot really consider it an upset in the game between close teams when 5th ranked Fukuoka Rizing (9-30) lost at home to sixth ranked Yokohama BC (11-28) 85-77 on Saturday. Yokohama BC made 17-of-21 free shots (81.0 percent) during the game. They looked well-organized offensively handing out 21 assists. It was a good game for the former international guard Takuya Kawamura (193-86) who led his team to a victory with 23 points and 7 assists (went 8 for 8 at the free throw line). American forward Brandon Costner (206-87, college: NC State) contributed with 19 points, 6 rebounds and 4 assists for the winners. Four Yokohama BC players scored in double figures. American center Dexter Pittman (208-88, college: Texas) answered with 9 points, 15 rebounds and 5 assists and British forward Benjamin Lawson (216-95, college: W.Kentucky) added 14 points and 9 rebounds in the effort for Fukuoka Rizing. Fukuoka Rizing's coach Ryuji Kawai tested eleven players, but that didn't help to avoid defeat in this game. Yokohama BC maintains sixth place with 11-28 record. Fukuoka Rizing lost their sixth game in a row. Newly promoted team keeps the fifth position with 30 games lost. Yokohama BC will have a break next round. Fukuoka Rizing will play again at home against Yokohama BC (#6) and it may be a tough game between close rivals. Another exciting game for Kyoto Hannar. 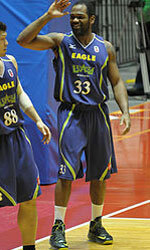 (22-17) which played in Nagoya against second-best Diamond Dolphins (21-18). Third ranked Kyoto Hannar. won 89-82. It ended at the same time the two-game winning streak of Diamond Dolphins. It was a key game for the second position in the league. Strangely Diamond Dolphins outrebounded Kyoto Hannar. 35-23 including 25 on the defensive glass. Their players were unselfish on offense dishing 23 assists. It was a great evening for American center David Simon (208-82, college: PFW) who led his team to a victory scoring 36 points (!!! ), 8 rebounds and 4 assists. Zimbabwean-American Julian Mavunga (203-90, college: Miami, OH, agency: Pensack Sports) helped adding 26 points and 9 assists. The best for the losing side was American center Hilton Armstrong (210-84, college: Connecticut) with a double-double by scoring 18 points and 10 rebounds and the other American import Markeith Cummings (198-88, college: Kennesaw St.) scored 18 points and 7 rebounds. Both teams had four players each who scored in double figures. Diamond Dolphins' coach rotated eleven players in this game, but that didn't help. Kyoto Hannar. have an impressive series of five victories in a row. They moved-up to second place. Diamond Dolphins at the other side dropped to the third position with 18 games lost. Kyoto Hannar. will have a break next round, and it should allow them to practice more before next game. Diamond Dolphins will play again at home against the league's second-placed Kyoto Hannar. and it may be a tough game between close rivals. Rather predictable result when third ranked Toyota Alvark (27-12) won against 6th ranked Shiga L-Stars (8-31) in Tokyo 83-70 on Saturday. Toyota Alvark looked well-organized offensively handing out 24 assists comparing to just 11 passes made by Shiga L-Stars' players. It was a good game for American center Alex Kirk (211-91, college: N.Mexico, agency: Pensack Sports) who led his team to a victory with a double-double by scoring 20 points and 10 rebounds. Guard Seiya Ando (184-92) contributed with 16 points for the winners. Four Toyota Alvark players scored in double figures. Nigerian-American power forward Gani Lawal (206-88, college: Georgia Tech, agency: Octagon Europe) answered with a double-double by scoring 33 points (!!!) and 14 rebounds and American forward Marqus Blakely (201-88, college: Vermont) added 28 points and 13 rebounds in the effort for Shiga L-Stars. The victory was the sixth consecutive win for Toyota Alvark. Defending champion maintains third place with 27-12 record having six points less than leader Ryukyu GK. Shiga L-Stars lost their third game in a row. They keep the sixth position with 31 games lost. Toyota Alvark will face again Shiga L-Stars (#6) at home in the next round. Fifth-ranked San-en NeoPhoenix (17-22) was very close to win a game against second ranked Toshiba Thunders (23-16) in Kanagawa on Saturday. Toshiba Thunders managed to secure only two-point victory 83-81. However their fans expected easier game. It ended at the same time the four-game winning streak of San-en NeoPhoenix. Toshiba Thunders looked well-organized offensively handing out 21 assists. It was an exceptional evening for international power forward Nick Fazekas (211-85, college: Nevada) who led the winners with a double-double by scoring 31 points, 11 rebounds and 4 assists. American power forward Vernon Macklin (208-86, college: Florida) accounted for 19 points and 7 rebounds for the winning side. Point guard Shinnosuke Ohishi (174-87) came up with a double-double by scoring 18 points, 11 rebounds and 7 assists and American center William McDonald (211-79, college: S.Florida) added 21 points and 12 rebounds respectively for San-en NeoPhoenix in the defeat. Four San-en NeoPhoenix players scored in double figures. Both coaches used bench players in such tough game. Toshiba Thunders maintains second place with 23-16 record having ten points less than leader Ryukyu GK. Loser San-en NeoPhoenix keeps the fifth position with 22 games lost. Toshiba Thunders will again meet at home San-en NeoPhoenix (#5) in the next round. San-en NeoPhoenix will have a break next round. An interesting game for Toyama Grouses (20-19) which hosted in Toyama their close opponent Osaka Evessa (15-24). Fourth ranked Toyama Grouses had an easy win 85-50. Toyama Grouses dominated down low during the game scoring 50 of its points in the paint compared to Osaka Evessa's 18 and made 17-of-17 charity shots (100 percent !!!) during the game. Toyama Grouses players were unselfish on offense dishing 21 assists. The best player for the winners was American center Joshua Smith (208-92, college: Georgetown) who had a double-double by scoring 19 points and 12 rebounds (went 7 for 7 at the free throw line). His fellow American import forward Leo Lyons (206-87, college: Missouri) chipped in 26 points. At the other side the best for losing team was American forward Josh Harrellson (208-89, college: Kentucky) who recorded a double-double by scoring 16 points and 12 rebounds and the former international forward Naoya Kumagae (194-90) added 15 points respectively. The winner was already known earlier in the game, so both coaches allowed to play the bench players saving starting five for next games. Toyama Grouses maintains fourth place with 20-19 record which they share with defeated Osaka Evessa. Osaka Evessa at the other side keeps the fourth position with 24 games lost. Toyama Grouses' next round opponent will be again Osaka Evessa (#4) at home. An interesting game for Tochigi Brex (31-8) which hosted in Tochigi 4th placed Hitachi Sunrockers (18-21). Second ranked Tochigi Brex had an easy win 91-71. It ended at the same time the two-game winning streak of Hitachi Sunrockers. Tochigi Brex looked well-organized offensively handing out 25 assists. It was a good game for American forward Jeffrey Gibbs (188-80, college: Otterbein) who led his team to a victory with a double-double by scoring 18 points, 15 rebounds and 7 assists. His fellow American import forward Ryan Rossiter (204-89, college: Siena) contributed with 11 points, 5 rebounds and 8 assists for the winners. Canadian center Robert Sacre (213-89, college: Gonzaga) answered with 17 points and 9 rebounds and American Ryan Kelly (211-91, college: Duke) added 8 points and 8 rebounds in the effort for Hitachi Sunrockers. Both coaches tested many bench players and allowed the starting five to rest. Tochigi Brex maintains second place with 31-8 record having just two points less than leader Ryukyu GK. Loser Hitachi Sunrockers keep the fourth position with 21 games lost. Tochigi Brex will face again Hitachi Sunrockers (#4) in Tokyo in the next round.